AUTHENTIC, CHIC TIMELESS CHANEL THICK CHAIN BRACELET. 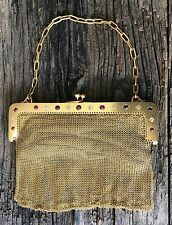 18K GOLD MESH PURSE with CHAIN=DIAMONDS & RUBIES=EDWARDIAN?=VICTORIAN?=REDUCED!! JOY & IMAN Goldtone Watch Pendant & 14" Chain Chatelaine for Handbags! Necklace Pink Enamel Hibiscus Flower Purse Charm Stainless Steel Ball Chain 22"
Necklace Red Enamel Hibiscus Flower Purse Charm Stainless Steel Ball Chain 28"
Necklace Clear CZ Message Purse Charm Pendant Stainless Steel Ball Chain 28"
Vtg Lovely Sterling Garnet Handbag Purse Locket on 19" Chain Free Shipping! MEXICO STERLING SILVER HANDBAG CLUTCH PURSE EXTRA LONG CHAIN NECKLACE 25.5"
Necklace Enamel Hibiscus Flower Purse Pendant Stainless Steel Ball Chain 22"
This page was last updated: 24-Apr 23:20. Number of bids and bid amounts may be slightly out of date. See each listing for international shipping options and costs.